Funk Farms is home to the first commercially sold hybrid seed corn produced in the world, Funk's G Hybrid. Funk Farms is family owned and their mission is heritage based revolving around farmland sustainability and viability for future generations. This goal is guided by a staff employees of various backgrounds. Learn more about the robust history of Funk Family. Learn more about our Pasture grazed cattle, Custom Cattle feeding, Stocker cattle, Bred Heifers, and compost production. Learn more about Funk Farms day to day crop operations producing commercial corn, non-GMO beans, and hay. The current 2500 acre farm dates back to the 1820's once part of 25,000 acres accumulated by settlers Isaac and Cassandra Funk. E.D. Funk Sr., son of Isaac and Cassandra, entered the seed business in 1901. The business grew rapidly with additional guidance from E.D. 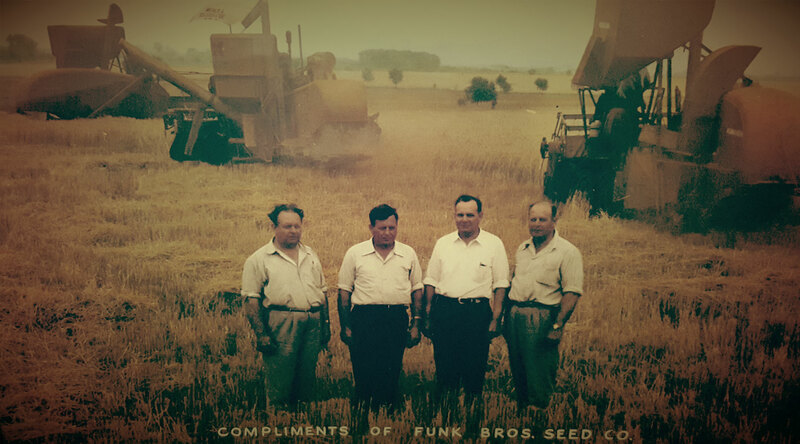 Funk Jr. and quickly became one of the nation's largest seed companies, Funk Bros. Seed Company. The seed company was eventually sold in the late 60's but continued to be sold under the Funk's G Hybrid name into the 90's. In 1941, E.D. Funk Sr. established what is currently known as Funk Farms Trust. It is this trust which currently operates approximately 2500 acres of farmland and pasture. What is Food Biotechnology? You may surprised at the benefits to the environment, consumer and farmer. Also what can we expect for the future of Food Biotechnology?